after a slightly longer break than intended. Having spent most of the summer holiday de-cluttering and tidying, I've been trying to exercise some self-control in my thrifting. It's rude not to browse charity shops after you've just donated bags of stuff, though, isn't it? I seem to have accidentally adopted a red/orange theme in my recent buys. They're not colours I normally buy, but I am enjoying their cheerful presence in my kitchen at the moment. 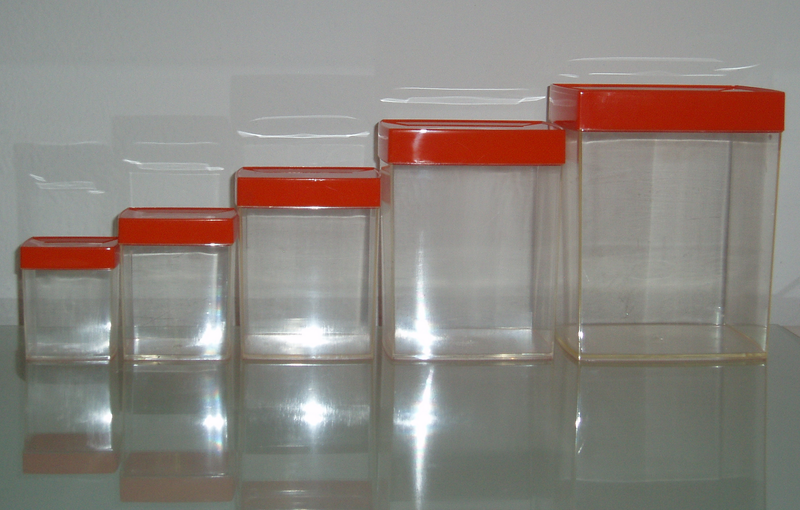 This "Thetford" heat-proof tray was the first of my red buys. I was looking at a huge tub of old buttons on the counter, and the helpful volunteer fetched this tray from the back of the shop for me to empty them onto. The buttons were all a bit manky and boring, but after I thanked her for getting the tray, I asked if it was for sale. She seemed surprised that I would want it, and said "£2?". Yes please! These storage canisters were still wrapped in their original tissue paper, so until I got them home I thought I'd just bought three. I specially love the tiny ones. A real bargain at £1. I love everything about this Myott Ceramite coffee pot, another £1 bargain that I almost didn't buy because I never use coffee pots, though I drink so much coffee I probably should give it a go! 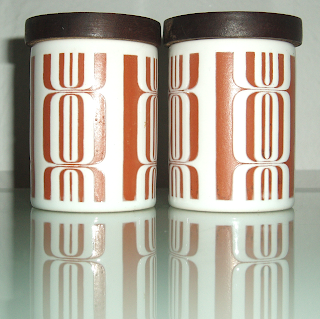 These Hornsea salt and pepper pots were actually put out on the shelf after I'd looked at the bric a brac and was browsing the books at the back of the shop. As I was walking back through the shop I just glanced back to make sure I hadn't missed anything and there they were. Even better, they were marked at 50p for the pair. I've never seen this pattern before and have had no luck with Googling - does anyone know the name of this design? Hope everyone has had good thrifting luck, I'm looking forward to catching up with all my favourite blogs. I'll be linking up to Selena's Thrift Share Monday, and anyone else who'll have me! Great finds. Love the coffee pot and the tray. 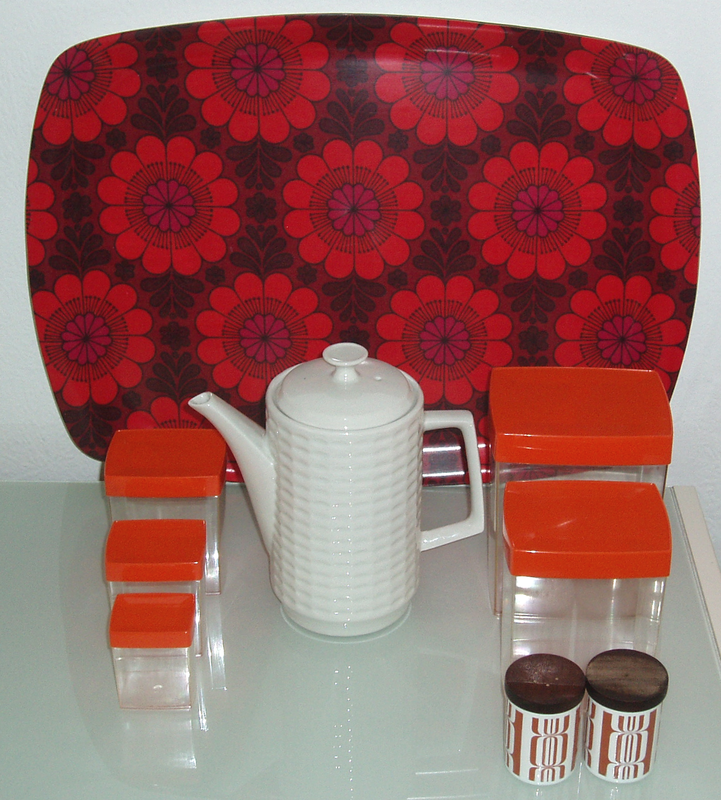 I also got a Thetford tray for £2 over the summer like yours but with a black and orange pattern on. I think the tray is lovely, welcome back! I love everything you've bought- and such brilliant prices! I love that tray! I always donate a couple of bags then walk out with more than I donated. that floral tray is gorgeous! the canisters are a lovely find too. Really love the canisters and the salt and pepper shakers are very cute. fabulous finds!!! Love the red platter! What nice finds. I specially like the Hornsea salt and pepper set. I think it's from a range of 'geometric' cruets made in 1971. 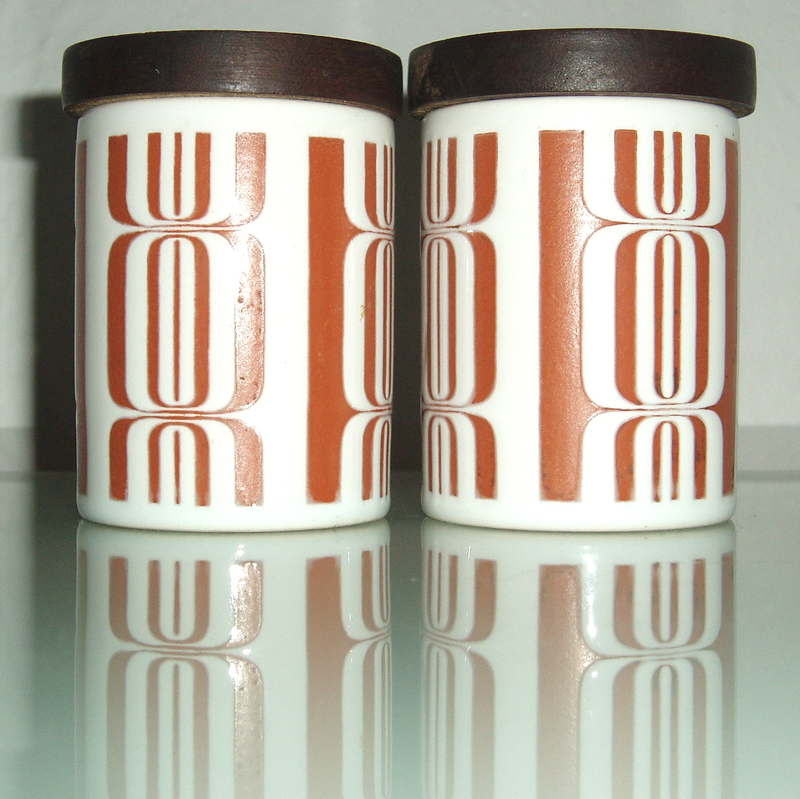 I did a blogpost on Hornsea geometric cruets back in April but you won't find your cruet there because it's one I haven't managed to find yet.